Cast: Shia LaBeouf, Jai Courtney, Gary Oldman, Kate Mara, Tory Kittles, Charlie Shotwell and Clifton Collins Jr. Chances are if you ask a veteran what the most realistic war film is, you’ll be told there isn’t one. As lived-in and frightful as Steven Spielberg’s highly acclaimed SAVING PRIVATE RYAN may have been, there is no film that captures the totality of the military experience. Like so many before him, filmmaker Dito Montiel (A GUIDE TO RECOGNIZING YOUR SAINTS, FIGHTING) does his best to seek the reality of war. While you have to admire Montiel’s ambition in trying to approach the material with an unconventional method, MAN DOWN blows its overall message out of proportion with an unapologetically manipulative and sloppy story. In short, the film is about veterans experiencing post-traumatic stress disorder, but the story builds around the concept in a rather complex manner. It proceeds with four timelines, which abruptly jump back and forth with no clear or serviceable point (an artistic excuse for bad editing). Kate Mara and Shia LaBeouf star in MAN DOWN. Courtesy of Lionsgate Premiere. In one, Shia LaBeouf’s Gabriel Drummer is searching for his kidnapped son, Jonathan (Charlie Shotwell), in a postapocalyptic wasteland (yep, you read that right), with the assistance of his battle buddy Devin Roberts (Jai Courtney). In another timeline, he enjoys a loving family life with his wife (Kate Mara, who’s in this for some reason) and son. In the third portion, he faces the challenges of boot camp (where every war film’s drill sergeant does his best R. Lee Ermey impression) before being shipped off to Afghanistan on a high-risk patrol. And lastly, he has a sit-down with a military psychiatrist (Gary Oldman, who’s also in this for some reason), who is seeking information on a traumatic “incident” that happened in said Afghan war. As you can see, there’s a lot for audiences to soak in and piece together. On paper, this could have been a gripping war and postwar story, drawing inspiration from the likes of AMERICAN SNIPER, JARHEAD and other films both recent and classic. Certainly many war movie cliches are present, with the obligatory training montage as a well-executed example. Upon deployment, however, the story loses what respect it had for the reality of returning home from war. Of all the elements in MAN DOWN, LaBeouf is the strongest. Since abandoning the popular Disney Channel series Even Stevens, LaBeouf has been going full Miley Cyrus to make sure you never register his name with the House of Mouse again. Through titles such as Fury and the recent AMERICAN HONEY, LaBeouf has shown his capability to dive into roles in a unique way. 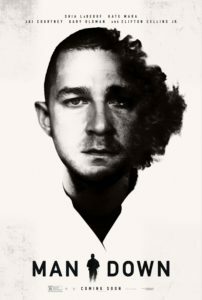 Even when a film crumbles around him, like in MAN DOWN, LaBeouf’s devotion and intensity slip through the cracks. However, most unfortunately, this movie has a senseless and hard-hearted twist to deliver, one that milks a laughably absurd amount of melodrama out of a soldier’s trauma. It’s quite literally so farfetched and heavy-handed that I should recommend the movie, so you can experience the boiling frustration until its eruption. While I would love nothing more to spoil the fun — because after you see a terrible movie you just want to reveal its secrets — let’s just say it doesn’t warrant the film’s post-apocalyptic segment. MAN DOWN attempts to cram a murky mass of plot and emotion into an hour-and-a-half of screen time. In the process, little of its meaning survived, and we’re left with an appalling film that hides behind a misdelivered moral about how little we care for our veterans. Though important for us to hear, that message can’t save this movie from being the disaster it is. MAN DOWN opens nationwide on Friday, Dec. 2. Movie Review: ‘ALWAYS SHINE’ – Why can’t we be friends?